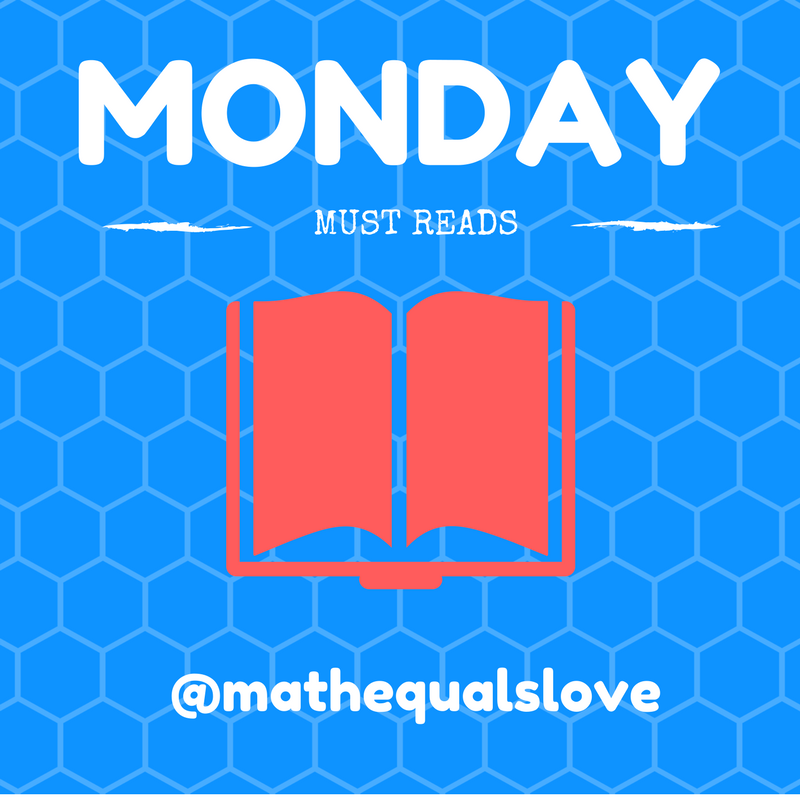 Full Disclosure: I started this post over a week ago with the hopes of posting it for LAST Monday's Must Reads. 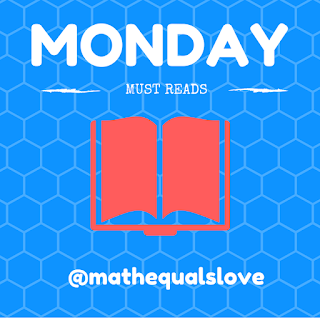 When I didn't finish it on Sunday or Monday, I started to think I would post it on Tuesday as a one-day-late version of Monday Must Reads. Now, here we are, an entire week later on another Monday. I think every year I forget just how crazy the beginning of the year is. Plus, this year is extra crazy with teaching at a new school and having new preps! I hope that you can find some inspiration in these share-worthy tweets from the past few weeks. Heather Moore shares a link to the US Math Kangaroo website where you can find all sorts of awesome math problems for your classroom! From just a quick glance, I know I need to spend some quality time here looking for problems to use with my students! Here are a few of the 2018 sample questions that caught my eye. Can't get enough of Monday Must Reads? Sam Shah is compiling his own posts with his favorite twitter posts and ideas. I love reading his commentary and being reminded of ideas that I've seen and since forgotten. Plus, I get a chance to see tweets from people I don't follow YET. Looking for classroom decoration ideas? Check out Jo Morgan's Maths Display Page. I needed to see this quote shared by Courtney Cochran. Jessica shares some awesome new posters on her blog! Ashli shares an image that could spark some interesting conversations. David Butler shares an interesting strategy game to play with students called the Daisy Game. Heather Paulson shares her awesome table numbers! I really like this problem from the UK Mathematics Trust. I recently ran across the Maths wi nae Borders twitter account and found several lovely puzzles. This task from Teejay Maths also caught my eye! Gemma Hoy shares a beautiful bulletin board! Kristen Rudd offers up a yummy WODB problem. Jill Church shares an awesome beginning of year project that doubles as a beautiful classroom display! Zach Berkowitz shares some cool puzzles that might make an appearance in my classroom later this year! Samuel Down shares a photo of his awesome math clock. I love Becky Roloff's idea of having a Pi Day Coloring Contest. Check out this mailbox in Amber Longhi's classroom! I love how Jennifer Fairbanks displays students' desmos creations! Julie Chamberlain's organization of her Puzzle Crate is inspiring! Find this puzzle and more to download on my puzzles page! Check out this great class culture building activity from Mandy Fernandes! I've seen the idea of human box plots floating around on twitter for awhile. But, I really like the look of this one from Melissa Pool. I LOVE this puzzle bulletin board from Mrs Tang! Paul Jorgens' use of Desmos is always inspiring. I love this process of having students draw a graph that represents a story about a sport and then having other students determine what story the graph is telling. I really like how Sam Rhodes combined WODB with Algebra Tiles! Having taught science in the past, I love Lauren Stewart's idea of starting the year off with a black box activity. Another awesome idea from another awesome science teacher: Kate McNabb! Students first constructed outlines of their bodies on the wall. Then, they were given anatomical elements to locate and label. I love how Ms. Sylvester used math to cover this window in her classroom. So beautiful! Jamie Back's recent blog post about 3D printing flowers from polar graphs has me wishing my school had a 3D printer! Maya Maroun brings the classic locker problem to an entirely new level by using two color counters as manipulatives. Brilliant! Mr. Derstein inspires with a pirate themed classroom for what was surely a memorable learning experience! Negatives and exponents. I can hear you groaning just thinking about teaching this tricky topic AGAIN. Check out this notice and wonder activity from Stephanie Ling to get students thinking like mathematicians instead of just memorizing rules. Check out this mirror and message from Cathy Yenca! I couldn't pass up sharing this funny #thingsteenagerssay moment from Mauren Ferger! Julia Robbins inspires with a bit of painter's tape and some magnetic numbers that create an awesome 1 to 9 puzzle for students to solve!